Last Saturday we headed to the Lower East Side to get our bagel fix at Russ and Daughters. 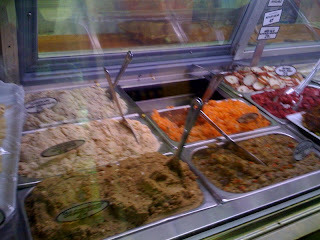 They've been selling lox, caviar, and herring from its same landmark Lower East Side location since 1914. Don't dare call this place a deli! Russ and Daughters is one of the last standing appetizing shops in NYC (at one point there were about 30 appetizing shops in the Lower East Side). According to Jewish dietary laws, meat and dairy can't be eaten or sold together. 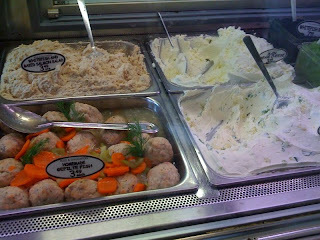 So deli shops are supposed to sell just meat, and appetizing shops sell fish and dairy (along with other things like sweets), which is why lox, bagel and cream cheese are the epitome of appetizing. 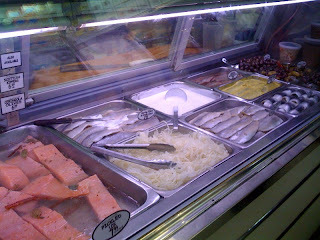 They also sell specialty items like Whitefish and Baked Salmon Salad. Their egg salad looked excellent. Everything looked so good and so fresh here, we wanted it all! And across the aisle from the fish/bagel/cream cheese section is their equally tempting sweets section - homemade chocolate, babka, rugelach, macaroons, chocolate jelly grahams, jelly bars and marshmallow twists, and a variety of Halvah. 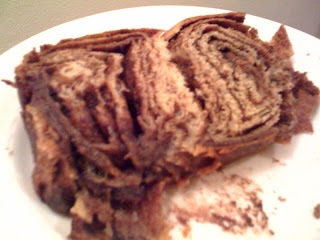 Again, we wanted it all but we narrowed in on the cinnamon babka. This layered dairy-free Jewish cake was so good that the loaf didn't last very long in our home. It was sweet but not overly sweet and there were these wonderful chewy cinnamon pieces evenly distributed throughout. Just phenomenal. Craving it as I'm typing this. They also sell dried fruit like Gooseberries and Medjool dates. We took home a bag of Turkish Apricots. What's great is they don't contain preservatives or added sugar. We think our moms will be getting a few bags of these. Another great thing about Russ and Daughters aside from their high-quality food is that it's impeccably clean and retains the old school neighborhood feel. The many workers wearing their traditional white jackets and crammed into this tiny store are friendly and quick. The shop is pretty small and gets crowded very fast, which is a small price to pay for quality goods. Last Sunday was the day of the snowstorm and it was cold. And we were apparently the only insane people willing to eat outside on Russ and Daughter's one bench in front of their store. It was a mighty challenge trying to eat with your gloves - you get the cream cheese all over them. You take off your gloves and your fingers quickly get frozen. But we're glad to know we acted as free advertisement for them - everyone that walked by the bench could not stop staring at us shoving our faces while cream cheese smeared all over our lips, chins, and nose. 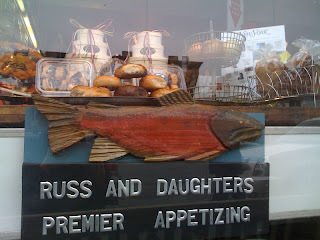 Russ and Daughters is run by the fourth generation of the Joel Russ family, which is amazing because the statistic is that supposedly less than 2% of family businesses make it to the fourth generation. So on a street where giants like Whole Foods have marked its territory (a street once filled with small family-owned shops), it makes the existence of a place like Russ and Daughters all the more significant and essential to a city as diverse and historic as New York City. Sure, Whole Foods also sells lox, bagels, and cream cheese, but you can't even compare the two (that would be as absurd as comparing your mom's homemade soup to a can you buy at Safeway). 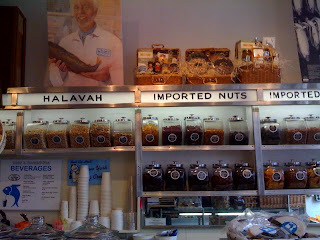 Although they're deeply rooted in tradition, one very modern thing about Russ and Daughters is their great website. Normally, store or restaurant websites are terrible - there's usually either too little information or too much nonsense you don't need, cluttered with very bad visuals and cheezy background music. Russ and Daughters is a fine example of how a website should be - containing a comprehensive list of everything they sell (in a uncluttered and easy to navigate way), and they even have a blog and a great page called Yiddishism. On our food guru Anthony Bourdain's recent "Disappearing Manhattan" episde of No Reservations, he said, "Russ and Daughters occupies that rare and tiny place on the mountaintop reserved for those who are not just the oldest and the last - but also the best." We knew about this place before Bourdain shed the light to millions of viewers but we're glad to add this to the list of food tastes and restaurant types we have in common with him. (On another note: We didn't know about a few places he covered on that episode and we'll bring you our own takes on them in our upcoming posts). By the way, since we don't have free travel channel here, we are seriously pining for his shows. If anyone has a copy of his "Disappearing New York" episode, please send it to us!